Announcing to your family that you are taking your children and moving 3000 miles away isn’t easy. We’ve been met with resistance. We’ve been hammered with guilt. Some understand, most don’t. Some make comments, some say nothing. The latest rash of negativity comes from my 78-year-old grandmother, a woman who has ventured outside of Scranton maybe three times in her entire life. “You can’t move around with kids. Children need roots, Amye,” she says over the phone on a Friday morning. The knot in my stomach grows tighter with every spark of doubt she releases into the air between us. She makes me think, her words make me think. I imagine my girls, twenty years from now, floating through the world without roots- drifters, vagabonds, unable to emotionally connect to anyone or anything. I grew up in a loving home with two parents. When I was twenty, my parents divorced and our home was sold. My mother moved into a small apartment across town, and my father moved in with a woman he was dating. My only sister was 2000 miles away in Georgia. According to my grandmother’s logic, I was rootless. And I felt that way. But instead of drifting, I rooted myself in anything that would have me. I rooted myself to my ex-husband and his family. I rooted myself to a job I hated. Why? Because I had been raised with relatively no change in my life, ever. So when change happened, I was terrified. I clung to anything, even if it was unhealthy. When I divorced, I was rootless once more. My sister moved away again, my in-laws, to whom I was very close, all abandoned me, and I had lost my husband. And once again, I handled it poorly. I self-destructed and it wasn’t pretty. It was a long, crazy year before I finally started to right myself and to find stable footing. The lesson I learned from these two periods of change in my life is that my roots are under my own two feet, not in another person’s house or life. My parents are my roots, not where they live or who they are with. Their love for me is my one true home. 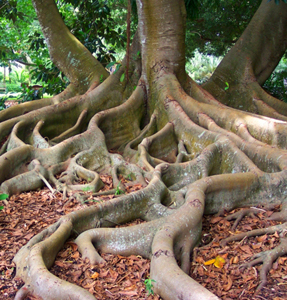 Your roots are who you are, not where you are. I don’t want my girls to become so rooted in Scranton, Pennsylvania, or anywhere for that matter, that they grow up and become afraid to leave and see the world. I want their roots to be me and Timmy, one another, or more importantly, themselves. I want them to be rooted in our love, not our living room. It is this belief that keeps me going, that allows me to make this move. I have to believe that the pain I’m feeling now by severing my own roots, will spare my daughters somehow. If not, well, I’ll keep plenty of bail money handy for when they are soulless, rootless, drifters.